Officially Catholic: The 2014 Catholic Education Week Ambassador’s Annabel Pike and Michael Mangan at the official launch of Catholic Education Week on July 30. QUEENSLAND Catholic schools took one week out of their busy timetables to show Australians why Catholic education was the best choice for Queensland students. The state’s 296 Catholic primary and secondary schools were invited to “pause” about the goodness of Catholic education in the community during this year’s Catholic Education Week celebrations between July 27 and August 2. 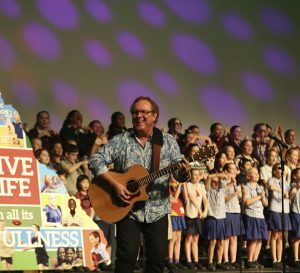 This year’s theme ‘Living Life in all its Fullness’ was complimented by the countless events coordinated by Queensland Catholic Education Commission. Brisbane Archbishop Mark Coleridge launched Catholic Education Week on July 30 at St Laurence’s College, South Brisbane. 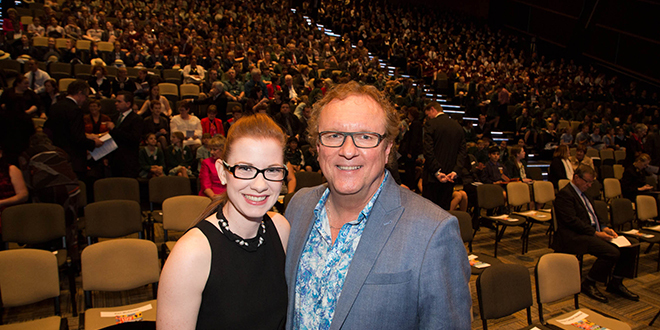 More than 1200 Catholic students and staff from Catholic schools across Brisbane attended the launch. Queensland’s Premier Campbell Newman and Education Minister John-Paul Langbroek also attended the launch. Michael Magan performs at the official launch of Catholic Education Week 2014. Both the premier and the education minister said Catholic education made an invaluable contribution to the community and were committed to maintaining strong relationships to better Catholic schools across Queensland. QCEC executive director Mike Byrne said Catholic Education Week was “a great time of celebration for Catholic education”. “Congratulations to Dioceses and schools across Queensland for what has been a wonderful celebration of the special ethos and mission of Catholic education,” Mr Byrne said. “The wide range of activities and events clearly demonstrated that Catholic education in Queensland is indeed ‘Living Life in all its Fullness’. “We get on each week from day to day doing what you do in schools, but it’s good to pause and think about what’s happening as a whole, and for us to celebrate what we do, and to be able to name it. Mr Byrne said Catholic educators and students needed to be a public witness in the community so Australians could see the benefits of Catholic education. Being connected in the wider community, not just within fellow Catholics, would motivate leaders of Catholic education to “do it even better”, Mr Byrne said. “But also, it’s an invitation to tell the whole community that Catholic education is not just at the closed doors at the gates of the school,” Mr Byrne said. “If we aren’t public out there telling the story, we can’t expect people to know it. Catholic Education Week Ambassadors nurse Annabel Pike and music liturgist and teacher Michael Mangan visited all five of Queensland’s Catholic dioceses. 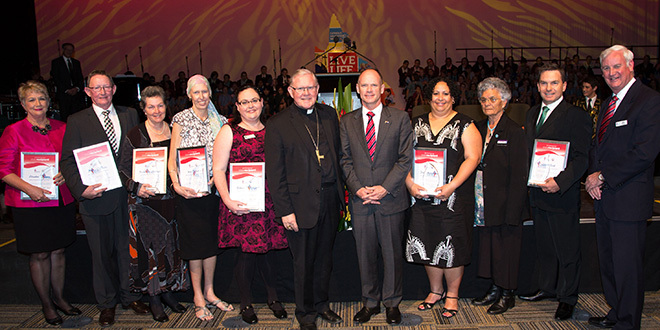 Special guests: Brisbane Archbishop Mark Coleridge (sixth from left), Premier Campbell Newman (seventh from left); Aunty Joan Hendriks (ninth from left) and Queensland Catholic Education Commission executive director Mike Byrne (right) are with Spirit of Catholic Education Award recipients for 2014 (from left) Elizabeth Poulton, from Sacred Heart Primary School, Toowoomba; Brian O’Reilly, from St Joseph’s Nudgee College, Brisbane; Bernadette Mitchell, from The Cathedral College, Rockhampton; Kim Bellert, from Diocese of Townsville; Rebecca McGregor, from St Peter’s Catholic Primary School, Caboolture; Pelly Morganson, from St Teresa’s College, Abergowrie; and Gavin Rick, from St Joseph’s School, Parramatta Park, Cairns.